Have you ever seen a deck or patio and been envious because you want something like that for your home? We know the feeling. Having a nice deck isn’t just an extra addition to a home – it becomes a part of the home. A deck can become an extension of who you are. From grilling out to reading a book, you can have family and alone time. Invite some friend over for a get together when the weather is nice or relax in the hot tub you have. We want to help you realize your dream of having the perfect deck for your home. We’ve gathered together some of the best software that will help you every step of the way, from visualizing your deck to helping you analyze the costs. We’ve separate them into both free and paid options so you can make the best choice. You will be amazed at how great these options are, especially the free ones. We’ve skipped over many of the free options that other sites use because they just weren’t worth putting on here. We want to bring you ones that actually work. Sure, the premium paid options have more features, but the free ones work to give you a great idea of how you want to build your deck. Decks.com is a great way to get started on figuring out how you want the layout of your deck to look. 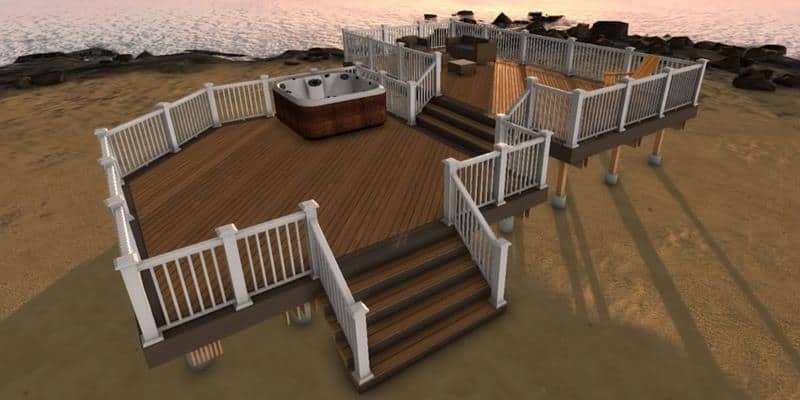 You can drop in different shapes to create an overall layout, get side views to adjust the height, plan the footing depth and railing height, and see a basic 3D rendering of your deck. You can also choose from many of their pre-made plans so that much of the guessing game is taken out of the equation. They offer plans for pool decks, porch decks, low and high elevation decks, and many more. Another great feature of the site are the many articles for deck designing tips to help you get started. The Azek software from TimberTech is great, as it allows you to use it on both a desktop and on a tablet. 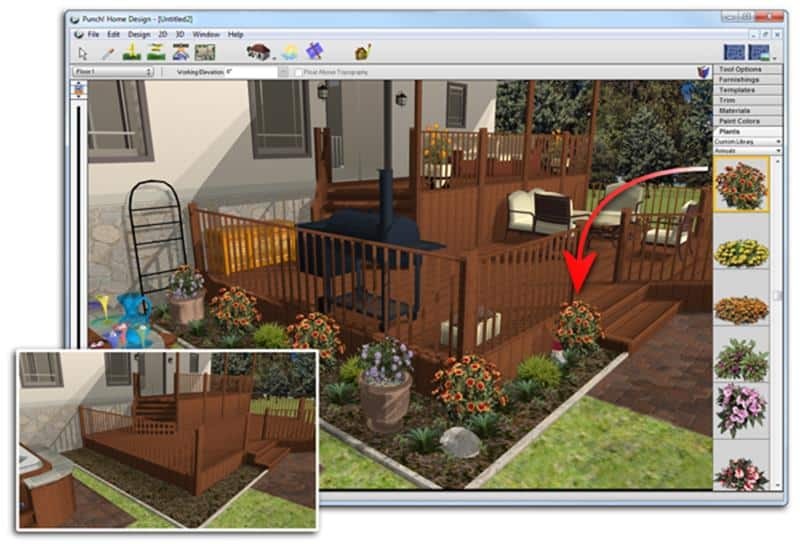 With this software, you are going to get 3D diagrams of your deck, a list of required tools and construction tips, a deck part identification glossary, checklists, and hardware guides. 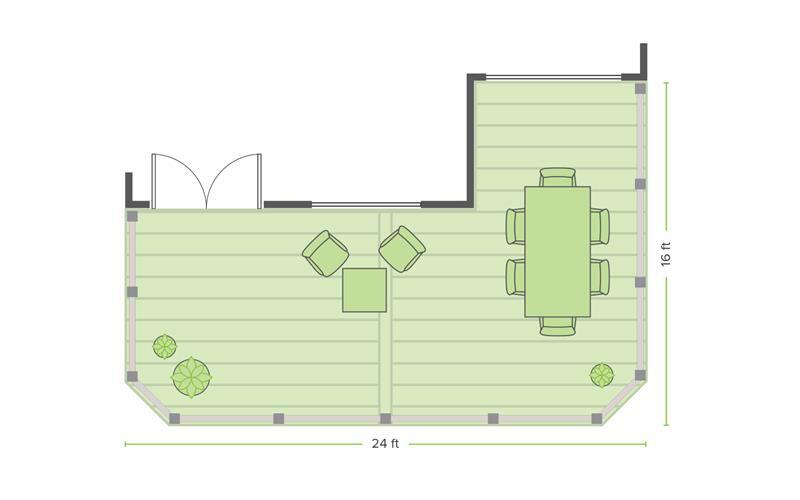 With the app, you can take a photo of your personal outdoor space then attach the deck you design to the image. How cool is that? You can actually see the deck you design in your own space. 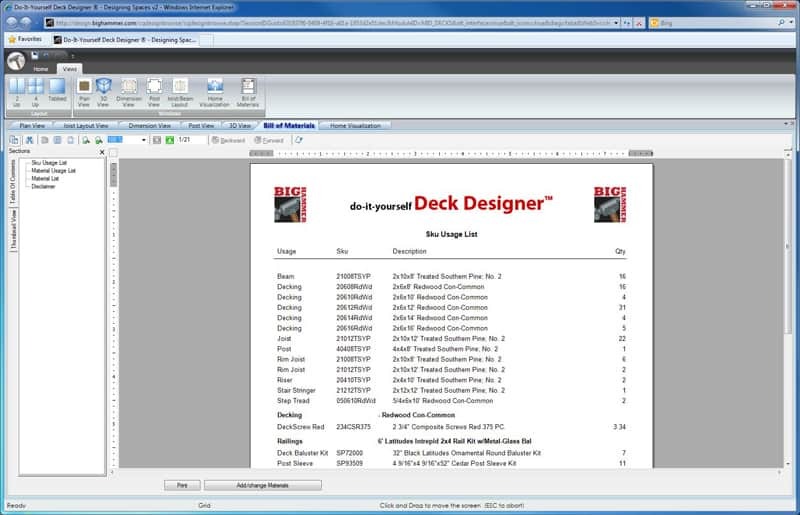 Trex is another great deck design software that allows you to use a desktop or a mobile device. 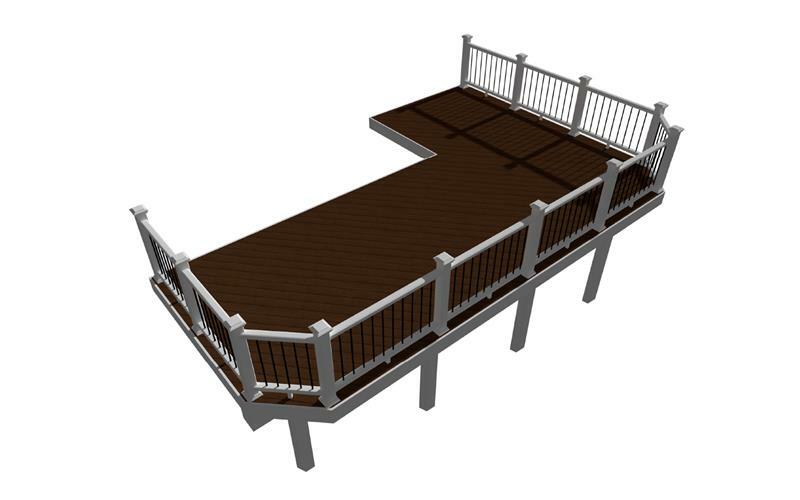 You choose your deck dimensions, mix Trex decking and railing materials, choose colors, and a list of materials will be generated for you. Their software will explain the various parts of the deck for you so you make the right choices base on expert knowledge. You can get help from their Trexperts, as you can see in the video below. Disclaimer: BigHammer only works with Interned Explorer. We have mentioned BigHammer before when giving you some garage design software. We bring them back because they truly are helpful when it comes to building things. We like BigHammer because they really offer you a great chance to visualize your deck as well as everything that may go around it. You can add trees, shrubs, and landscaping to the scene and customize it with photos of your own home and yard. You can get realistic shading and a 3D rotation rendering. BigHammer offers over 70 deck templates for you to choose from or you can free hand your own design. When you get the design you want, BigHammer will give you a complete list of everything you will need to complete your project. SketchUp makes another appearance for us, having been seen when we discussed garage design software. The free version of SketchUp is remarkable. SketchUp interfaces so well with both a desktop and a tablet, giving you mobility and control throughout the process. SketchUp has a large market share when it comes to home design, and they have large help sections throughout their website. You will benefit from their ability to walk you through the whole process, from the design basics to final material planning. The good thing about Idea Spectrum’s software is that they have specialized in landscaping, gardens, pools, and decks. Their focus is on the outside of your home. Since you want to design a deck, this is a good thing, as Idea Spectrum is the expert. There are three tiers to their software, all with various price tags, but you can likely get your deck designed with the less costly ones. With their software, you take a photo of the landscape you want to change, in your case, the area you want a deck. You will upload the photo and then begin your design. You can see how your deck will look in a real setting with your home and you can put plants, pools, and other objects around it. They have a night and day feature as well. With a huge library of materials to choose from, you will be all set with this software. Another software making a return from our garage designer article is this landscaping software from Chief Architect. If you get the Home Designer Professional software, it includes their landscaping and deck software as well. Chef Architect makes it easy with automated tools for all home design. 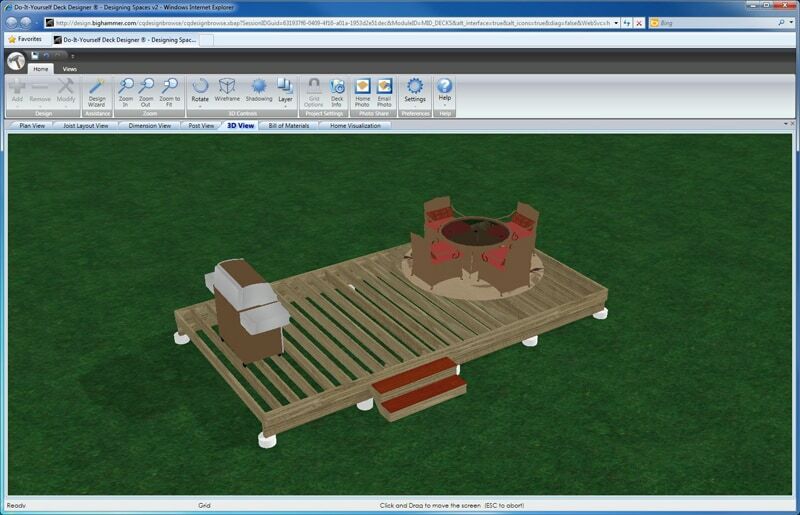 You can create construction drawings, elevations, CAD details, and 3D models. 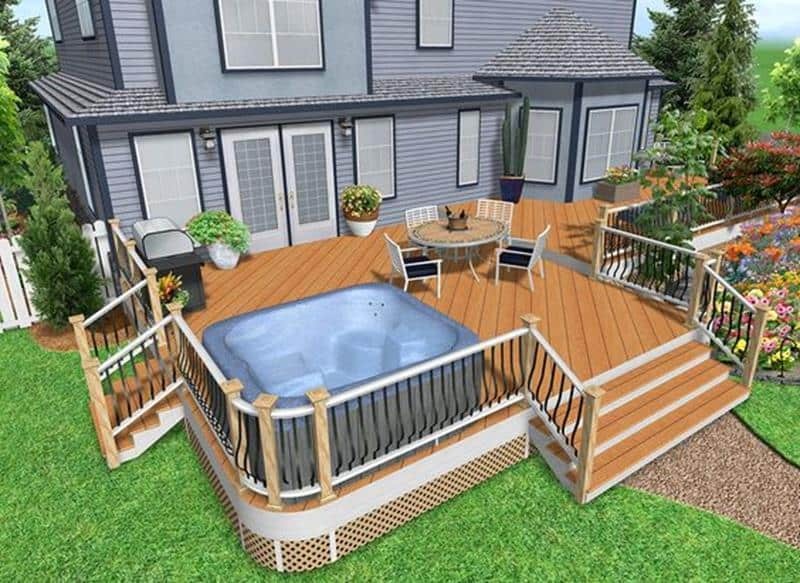 When you get your deck designed, you can export 360 degree panorama renderings in full 3D so you will really know how your deck will look when situated against the house. You can also rent the software for a lower cost than actually buying it, which is good if you are just working on short-term or single projects. The company has a bunch of helpful videos like the one below so you will have help along the way. Punch! Is great for both seasoned design veterans and people new to the design world. Meaning, you can do this even if you’ve never built anything before. This software will seamlessly go from 2D floor plans to 3D renderings, allowing you to take virtual walkthroughs of everything you design. 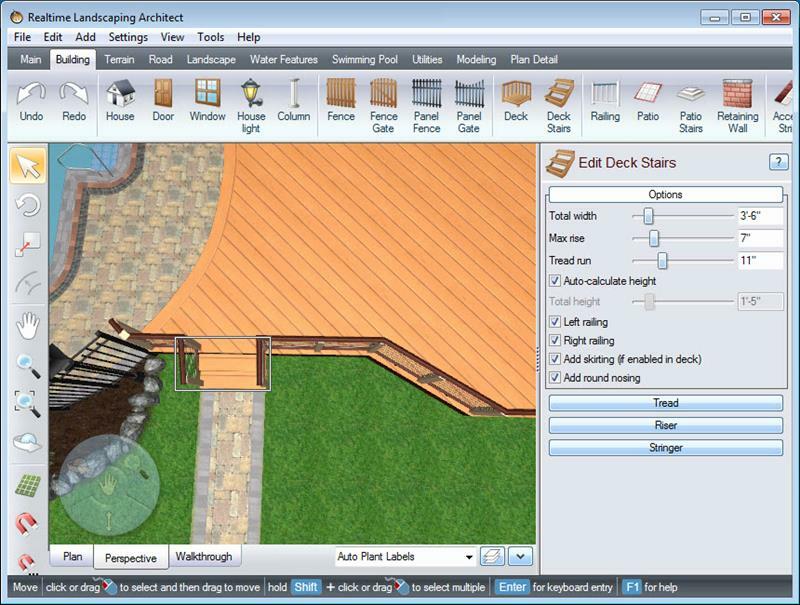 The landscape software helps you build patios, decks, outdoor kitchens, and lets you decorate around them. Want to see how a hot tub will look? Program it in. How about all the plants you’ve always wanted? You got it. 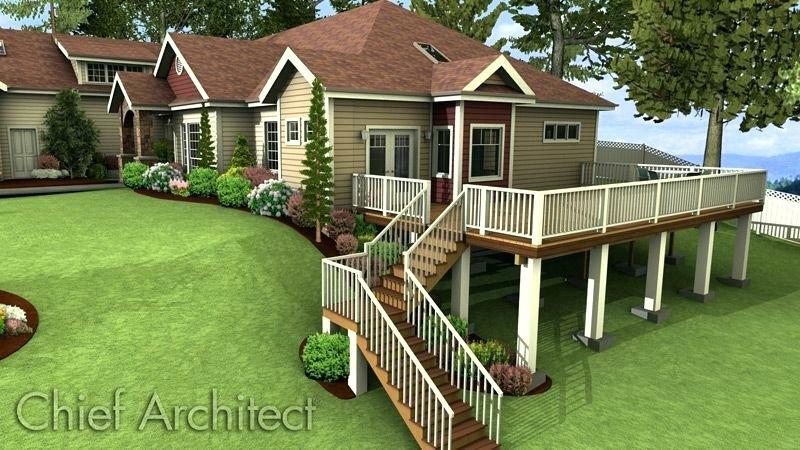 If you are designing an entire home as well as the deck, get the full version that comes with the landscape design. 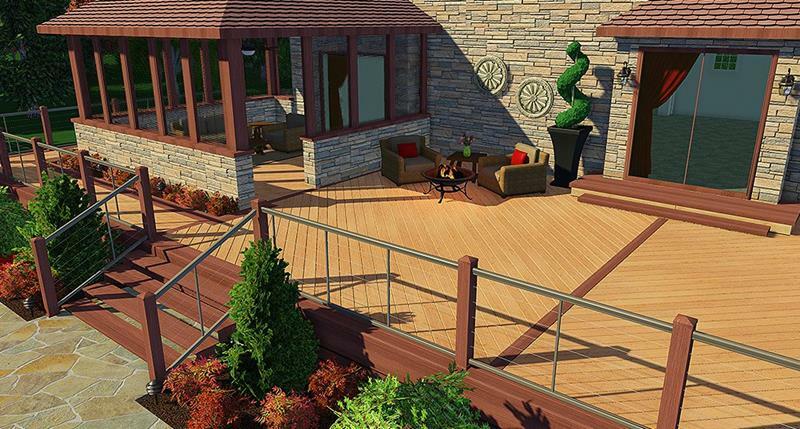 If you are only designing a deck, you can opt for just the landscaping part of the software. The first good thing about this software is you can rent it on a month-to-month basis, kind of like how Microsoft Office does now. That way, you don’t end up with a large purchase that you will only use once. 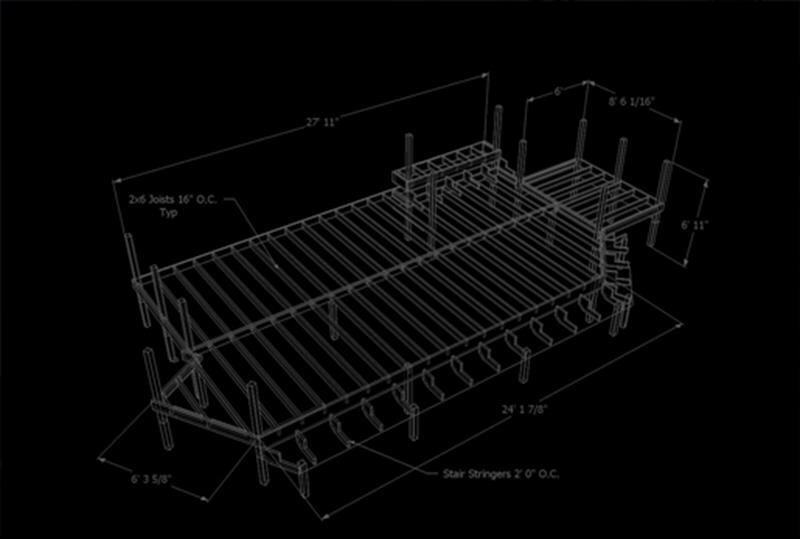 SmartDraw will help you the whole way through the process, from getting the measurements right to showing you what the deck will look like. One great feature of SmartDraw is that is allows you to insert drawings right into Microsoft Office, whether it is Word, PowerPoint, or Excel. It works with Google Docs and Sheets as well. It works on both Windows and a Mac, as well as on the cloud, so you have options. With this software, you will get plenty of blogs and video tutorials that will help you along the way. 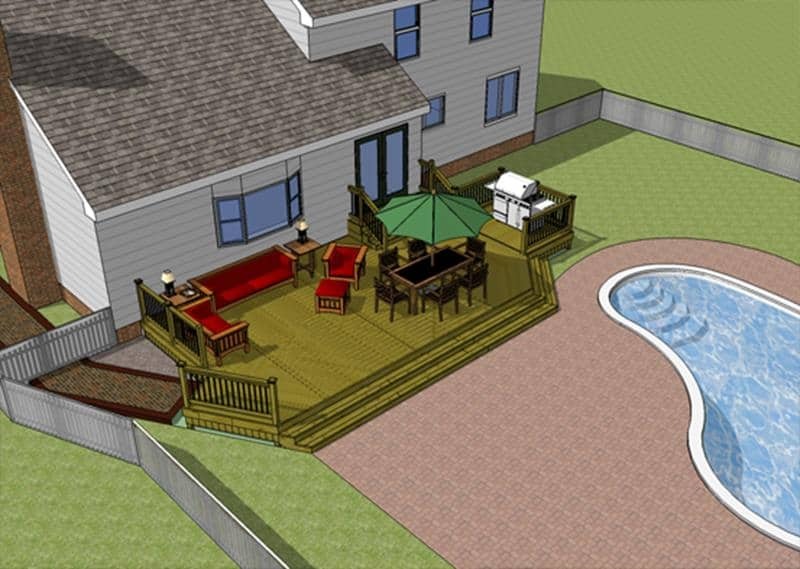 When you are designing a custom deck, VizTerra is a 3D design software from Structure Studios. 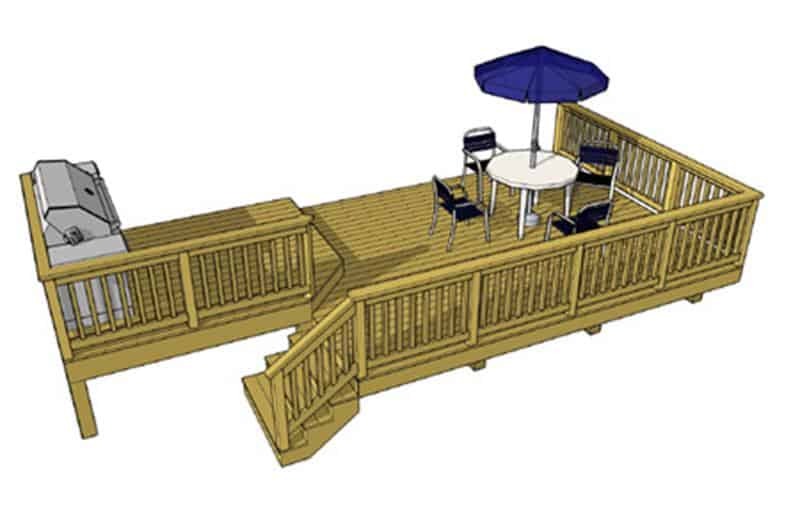 Everything you can think of when it comes to deck design is planned for with this software. From beams and posts, to stairs and fascia, everything is instantly and automatically calculated. This software was designed specifically for deck builders, so keep that in mind. You can create them n 2D, render them in amazing 3D, and have a list of everything you need. They have so many materials in their library that you can simply click on to add to your deck that every possibility is covered. This company is professional for professionals. If you are a serious deck builder, this is the route to go. We’ve checked all of these out and we want to give you our favorites for each category. 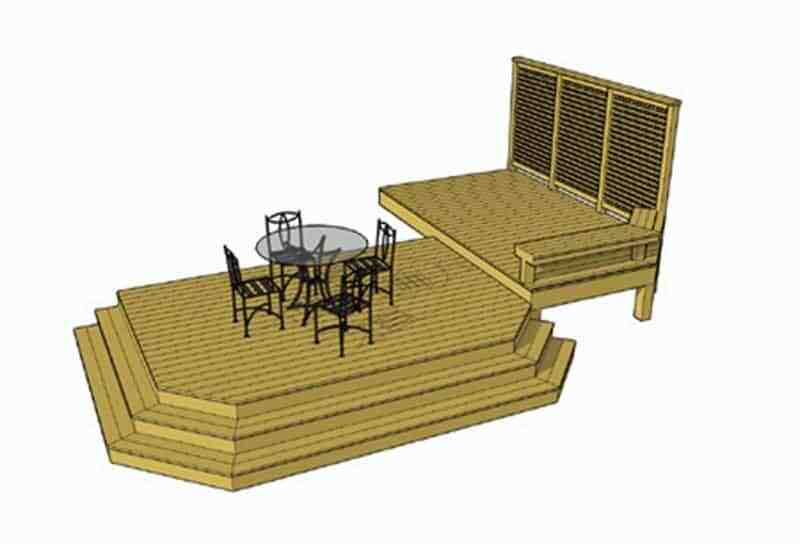 Best Free Option: SketchUp Deck Design Software. Nothing comes close to offering what you get for free here. The plans look amazing and you get versatility between devices. The Support for this program is amazing. Best Paid Option: Chief Architect. This company is great at what they do. Since they have software for designing all areas of a home, and around a home, they come equipped with everything you need to get the job done correctly.